Agathosma betulina is a shrub with many stems that grows up to two metres tall. Pairs of leaves grow on opposite sides of the stem. They are about 20 mm long and 10 mm wide. Oil glands can easily be seen under the leaves. The oil gives the plant a pleasant smell. The small star-shaped flowers have five petals on a short stem. Plants flower from June to November. Agathosma betulina is visited by a variety of insect species, especially bees and flies (generalist insect-pollination system). Seeds are released after flowers have dried. The fruit is a capsule with five sections. When ripe, it bursts open to release the seeds. The shrub can also resprout after fire. 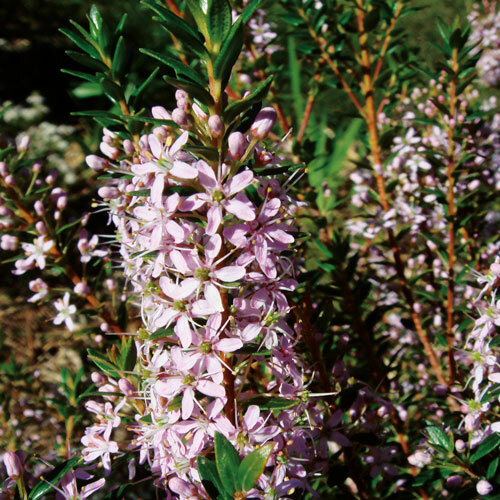 It grows on sandy mountain slopes at altitudes from 300-700 metres. It is found from Calvinia, through the Cederberg, Tulbagh and Ceres, to the Piketberg. It is commonly used as medicine and in the perfume industry. Buchu tea and Buchu brandy are taken to treat digestive and urinary tract problems. Agathosma betulina is threatened by activities, including over- harvesting and damage to its habitat.